Did you know that a translation memory (TM) file is just a text file with structure? Maybe you saw the file extension (*.tmx or *.xliff) and imagined it can only be opened with special software. In reality, all you need is a standard text editor (such as TextEdit on Mac or Notepad on Windows) and you can open it up. Additionally, you don’t need a PhD or computer degree to read it or understand the structure. For the most part, a translation memory file is straightforward and functional... it is not a black box. So what exactly is a translation memory file? A translation memory file holds translation and linguistic data in a structured format. It’s just a text file. More specifically, it is typically an XML (Extensible Markup Language) file, which is also a text file, but with a well-defined structure which provides ways to represent complicated data structures. What type of information does it store? What are the typical formats of translation memory files? It is easy to parse because it has a well defined structure. 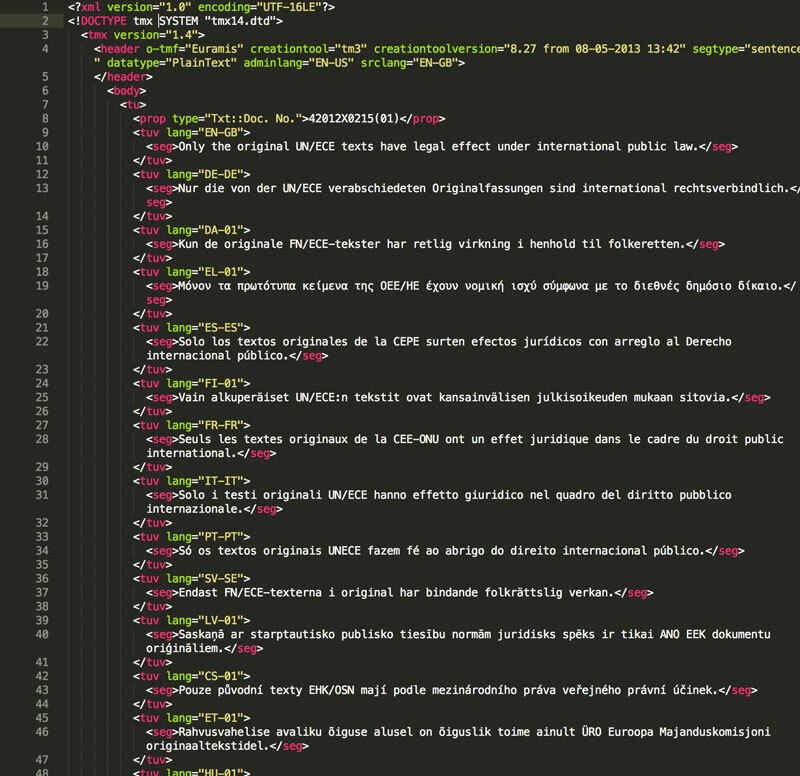 The structure and tags of an XML file often help indicate what the data means (i.e. semantic tags such as <segment>, <trans-unit>, etc.). There are many software tools built around the XML format to validate, import, parse, search, etc. Different applications and systems can interact and exchange data because an XML file typically has a well-defined structure. What's in a translation memory file? First is the header. The header contains metadata about the file and the localization process. Let's look at an example header for each file type. As you will see, the semantic naming of XML tags makes the files human readable - even without reading the actual specification you can probably understand most of the fields. Hover your mouse over an attribute for more details. creationtool="TRADOS Translator's Workbench for Windows"
In an XLIFF file the metadata attributes are stored in the <file> element. After the header comes the body. This is the section that contains the most important data - the translation units and segments. Let's look at an example body for both a TMX and XLIFF file. Why are translation memory files so important? Translation memory files are typically used by translators in their CAT or TEnT (translation environment tool) tool to help them translate more efficiently. Loading a translation memory file into a translation software tool allows a translator to leverage their prior work. If a segment in the current translation has already been translated before (or even partially translated before) the tool will help the translator by automatically alerting them of the match (or partial match). Translation memory files will also help you maintain consistency as a translator. Over your career you will work on many different projects for many different clients. Some projects might require specific terminology or phrases. Utilizing "client-based" or "project-based" translation memory will allow you to ensure accuracy and stay consistent with every translation you work on. What are the differences between TMX and XLIFF? TMX allows any number of languages in the same document. XLIFF is designed to work with one source and one target language. In a TMX file, a collection of <tu> elements has no specific order and contains no mechanism to rebuild the original file. TMX files can store time and date data at the translation unit level, while XLIFF files can not. Which format is better - TMX or XLIFF? Both TMX and XLIFF are powerful choices. They are both industry standard file formats and both are supported by the majority of translation software tools. Ultimately, whether you end up using a TMX or XLIFF file often depends on the project or tool you will be using. Additionally, sometimes a TM file might be provided to you for a particular job. Both TMX and XLIFF can get the job done well and using translation memory is 1000x better than not using translation memory (regardless of what file format you use). Many times you don't have to "choose" as you can download your translation memory from the tool you are using in either format. Translation units are (or at least can be) time stamped (Time stamped translation units allow you to later do a productivity analysis on your work). Multiple target languages can be stored in one file. On the other hand, if using the TM file to reconstruct or rebuild the original file is important to you, the XLIFF format is much more powerful in this regard. Try out this short quiz about translation memory files to check what you learned from this blog post. #1: You can open a translation memory file (such as a TMX or XLIFF file) in a standard text editor. #2: The term for the grouping that establishes an equivalence between a segment in one language and its translation. #3: Which of the following is a true statement about the difference between XLIFF and TMX? a) XLIFF is an XML-based file while TMX is in JSON format. b) XLIFF uses the <source> and <target> tags while TMX uses the <seg> tag. c) TMX files can carry information such as pretranslation and history, versioning, and binary objects while XLIFF can not. d) XLIFF is built to support translation into many different languages in the same file while TMX is designed to work with one source and one target language. #4: TMX files can store date and time information on the translation unit level. #5: The original purpose for the creation of the TMX and XLIFF formats was the same. United States Posted over 4 years ago. Japan Posted over 4 years ago. You answered False. The correct answer is True. Translation memory files such as TMX and XLIFF are XML files that can be opened and viewed in a standard text editor (such as TextEdit on Mac or Notepad on Windows). You answered . The correct answer is c). A translation unit is a grouping that establishes an equivalence between a segment in one language and its translation. You answered . The correct answer is b). XLIFF uses the <source> and <target> tags while TMX uses the <seg> tag. Unlike XLIFF files, TMX files can store date and time information on the translation unit level. You answered True. The correct answer is False. The TMX and XLIFF formats were created for slightly different purposes. XLIFF was created as a format to store extracted text and carry the data from one step to another in the localization process while TMX was created as a format to exchange translation memory data from one tool to another. Thanks for reading this blog post. If you need a secure, safe and easy way to manage your TM files be sure to try out TM-Town - registration is free. Please finish answering all of the questions.